In today's busy world, it feels like none of us have a chance to sit back and relax. Business meetings, school functions, running errands, etc. With how busy our lives are, we don't have time for those little emergencies, especially when it is the loss of a cell phone, tablet, or heaven forbid, our purse! When our expensive, personal items disappear, we panic and think of the worst case scenario. In actuality, it is likely laying where we left it or may have been picked up by a good Samaritan who has no clue how to get your valuable back to you. While name tags may have worked when we were kids, we really don't want strangers having our personal information. Wouldn't it be nice though if there was a way they could contact you without giving them such valuable information, allowing you to get your stuff back? Luckily, something like this does exist - Bungee Virtual Lost and Found! So, what are Bungee Tags? They are brilliant! Bungee tags anonymously mark your property and when it's lost, someone can text the number listed on the tag and report it. From there, Bungee facilitates a conversation between you and the person who found your item so that you can arrange a way to safely retrieve it. Best of all, it works anywhere in the world that has cell phone signal or internet! To learn more about all of their amazing plans and how they can protect your important electronic items, make sure to check out the Bungee website. They also set up an amazing deal for Moms, allowing you to save 50% off their coverage plans. Don't worry, you don't have to be a mom to take advantage of this exclusive offer, you just need to use this code at check out. As part of this awesome offer, Mom Powered Media and Bungee Virtual Lost and Found are working together to bring you this awesome giveaway! 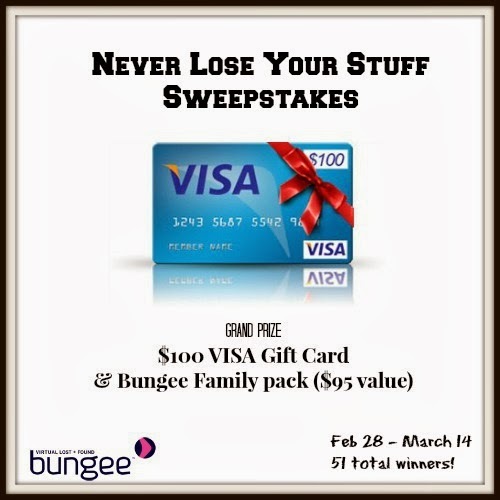 1 lucky winner will receive a $100 VISA Gift Card and a 5 Year Family Bungee Pack ($95 value). Another 50 winners will win a 2 year Bungee plan ($19 value). Make sure to read the rules below and then enter through the Rafflecopter! Disclosure: I did not receive compensation for this giveaway. Facebook, Twitter, and Pinterest are in no way associated with this sweepstakes. Prize fulfillment will be handled by sponsor. I like that it gives you the option to save 50% off your current plan. I like the anonymity of it. the anonymity of it, the having a third party (Bungee)handle the details of having your product returned. Wow! I love this concept. I have lost phones, cameras, and umbrellas, sunglasses, even books. I sure do need this. I like that Bungee® Virtual Lost and Found™ lets you anonymously mark your property and link it to your cell phone (and email). I love that now people have a way to return property. Usually people disregard turning items in (or stealing them) bc the owner is at a loss to find where they lost their stuff.